Hey.. Fellow Book lovers I am back today with a review on a book I purchase. 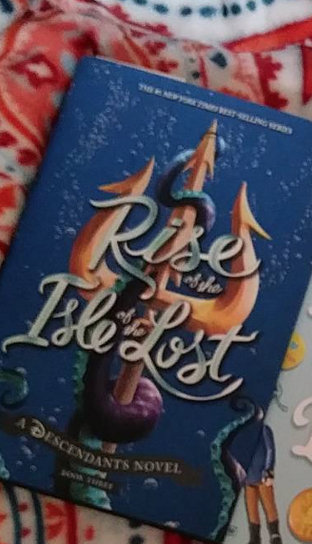 The Book is Melissa de la Cruz, “Rise to Isle of the lost”. It is the third book in the original Descendant Book Series, so far . It was publish between Descendants One and Descendants two movie. I purchase it recently from Amazon since the Second Descendants movie will be out in July. I have wanted to read all of the books since the first movie originally came out and has been on disney on replay. But enough about the movies let get to my summary on the third book. This book starts out with Mal, Ben and the Gang at an event for the people of King Triton. As the book Continues, along comes a freak Storm which the gang believes is clause from the talismans, that where found in the second book,"Return to the isle of the lost". When they get back to Ben's part of Auradon, they ask the fairy godmother to destroy the Talismans. Only to find out later that what really clause the storm is King Triton's Trident, which was stolen and lost. The Person who steals the trident ask Evie for help. Evie goes to Mal, who goes to the rest of gang, to try and help find the Trident. Through Evie magic mirror they find out that Uma, Ursula Daughter is also looking for the Trident. Uma wants to use the Trident as her way into Auradon and off the Isle. But who will find the Trident first, will it be Mal, Ben and the gang or will it be Uma. The only way to know is to buy the book and read it because I am not telling you. I would like to be very clear before I begin that I am looking at this book from the eyes of an adult. I do believe that Young Children would find this book far more enjoyable. So lets begin with my thoughts on the book. I rated this book 4 stars out of 5. I love the Rise to Isle of the lost more then the last two books. This third book reminds me of the first movie. It has that magical Disney Vibe about it. It makes me want to read more Descendants books and see more of the movies.The way Melissa wrote this book, I actually felt like I was apart of this world so much more and that I was able to see more of Ariel Story. I feel like that Melissa literally could pull off a Once Upon a time retelling with this series of all of the fairy tales. This third book had a Once upon a time feel to it, it felt like their was more to Ariel/ Ursula story then what we know.This book also sorta of gave you the impression that maybe Mal was missing her life from the Isle and maybe being Ben girlfriend was just a little to much. I felt like maybe Ben was being more responsible to his position as King and less as a Boyfriend to Mal, which could explain the storyline of Descendants two. This book clearly takes place before Descendants two, almost similar to the first book. The ending of this third book actually has me hoping for more books now in this series, and it also has me totally "Shipping” Ben and Mal as a forever couple. I enjoy this book far more then first two. I actually also felt like this storyline was more tied into what they are doing with the movies. I also believe this book was the best one yet. I really believe you should try this series, especially if you love the movies. This book is more like the movies in my opinion. I honestly can’t wait to see what happens next in this series, especially with Mal and Ben. All of the links will be listed below like always. Please follow, subscribe and share this blog along with my social medias.